The microstructure and mechanical properties of metallic materials are of the critical importance in the processing, selection, quality control and failure analysis of such materials due to their wide-spread applications ranging from the burner in our home heater to the mission-critical airplane jet engine. 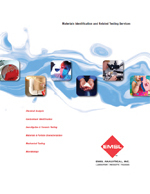 EMSL Analytical, Inc. offers routine and comprehensive metallurgical testing to determine the microstructure and mechanical behavior of samples, either per clients’ specification or as part of our efforts in finding the root cause of a failure during manufacturing or application. Sample Preparation: Precision sectioning, mechanical grinding, polishing (mechanical, electrochemical and precision ion polishing), chemical and plasma etching, sputter coating, ball milling and mixing, pressing and low & high temperature heat treatment. Instrumentation: Optical microscopes, scanning electron microscopes (SEM), energy dispersive X-ray analyzer (EDX), transmission electron microscopy (TEM), scanning Auger microscope (AES), universal mechanical testing systems, X-ray diffractometer (XRD), wavelength-dispersive X-ray fluorescence spectrometer (WD-XRF), inductively coupled plasma-atomic emission spectrometer (ICP-AES) and ICP-mass spectrometer (ICP-MS), LECO combustion analyzer.